I’m Don Van De Ven and I was born and raised in Northeastern Wisconsin and I understand the stress even the smallest of bugs can create in the one place you go to relax, your home. However, your home isn’t the only place that may be affected. Businesses risk losing their employees and customers if they aren’t providing a clean and healthy workspace. My approach to solving your pest problem is three-fold. First, I will help you get rid the infestation problem. I’ll do this in the quickest way possible and with as few disruptions to your daily routine as possible. Secondly, my aim is to educate you, together we’ll explore how the problem may have occurred. Finally, we’ll discuss what preventative measures can be taken to eliminate the risk of future, unwanted guests. 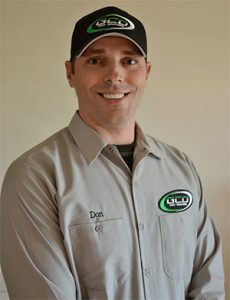 I am certified in three different areas of pest control: Structural Pest Control, Turf and Landscape and Mosquitos as well as licensed in the state of Wisconsin. I am up to date on all state testing and continuing education requirements. Prior to my start in the pest control industry, I graduated from St. Norbert’s College with a degree in Business. After college I spent time in Law Enforcement where I worked with the Brown County Sherriff’s Department. Pest Control is another way for me to help keep the residents of our community safe and healthy. My mission is to establish a personal friendship with everyone I work with. I will treat you how I would expect to be treated, listen to your concerns and provide solutions to your pest control needs. Copyright © 2015-2019 All rights reserved GCO Pest Solutions.